Meet Andra Hall – a 2002 Clemson Health Science alum who, like most of us, loves all things orange, purple and Clemson. She even met her husband, also a 2002 Clemson alum, at a Columbia Clemson Young Alumni Club meeting. 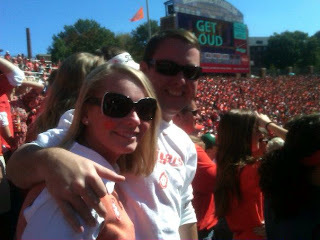 Andra and her husband attend every Clemson home game to cheer on the Tigers. She was always on the lookout for great accessories to compliment her gameday outfits and one day decided to try making her own. Andra made her very first Clemson pin and wore it all the time, even on her lab coat at work, because she loved it so much. She got so many compliments on the pin, that she decided to take up the craft as a hobby and make more. 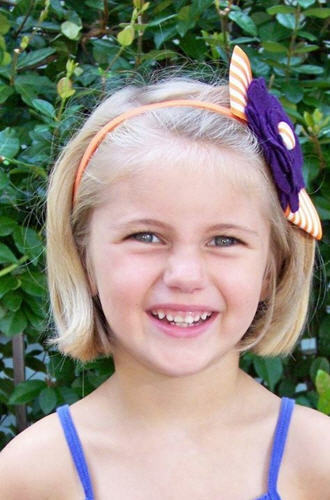 Soon she was making not only pins, but headbands, hair accessories, koozies and more. 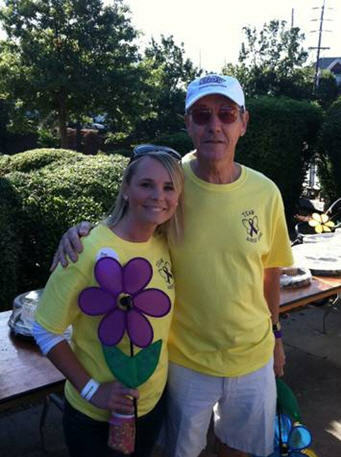 ..
Around the same time Andra started this new hobby, she learned that her sweet next door neighbor had Alzheimer’s disease, and his amazing wife was putting together a team for the Walk to End Alzheimer’s. As a pharmacist, Andra has seen several patients with this disease and the effect it has on people’s lives. She quickly joined the team, and tried to do her part to raise money for the walk. Finding it hard to ask people for donations in these tough economic times, Andra felt like she could use her new craft hobby to raise money for the Walk. She started the fundraising toward the end of August and wrapped up sales on October 15th, and was able to raise a total of $1,222 dollars for the Walk to End Alzheimer’s. Now that the fundraiser is over, Andra has decided to turn her hobby into a business and continue to sell her adorable Clemson designs. Since the products feature her unique hand crafted flowers, she came up with the name Bloomin’ Idiot Designs – love it! Most of her products are under $10! 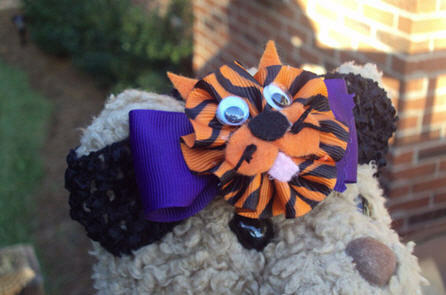 How cute is this Tiger headband? Only $8! You can shop Bloomin’ Idiot Designs on the Etsy site and follow Andra and Bloomin’ Idiot Designs on Facebook. You can also place special, custom orders with Andra through email: bloominkoozies@gmail.com. 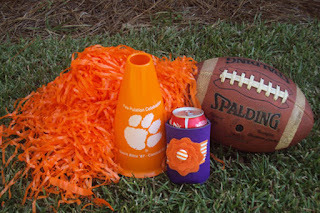 Bloomin’ Idiot Designs and Andra would like to give one very lucky Clemson Girl reader four of her handmade Clemson koozies – a $30 value! 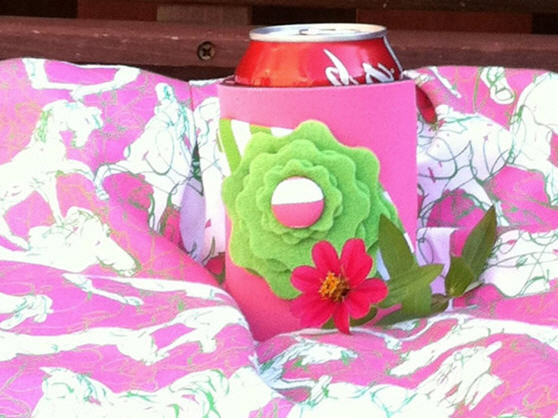 These are the perfect accessory for gameday and with four of them, you can share with your family and friends. Comment on this post with your first name, last initial and where you are from (1 entry). 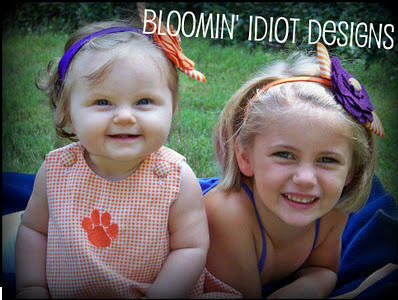 Follow Bloomin’ Idiot Designs on Facebook and comment “Clemson Girl sent me!” on the wall (1 entry). Share this giveaway on Facebook, then comment on this post letting us know you shared (1 entry). Follow Bloomin’ Idiot Designs on Twitter and then tweet about this giveaway – include a link to this post and copy @scbloominidiot and @clemsongirl (1 entry). Email a link to this giveaway to two friends and copy us (clemsongirlblog@gmail.com) on the email (1 entry). Deadline for all entries will be tonight at 7pm EST – we will randomly draw a winner and announce their name back on the blog around 8pm EST. The winner has 48 hours to claim their prize or we will draw a new winner. So don’t forget to come back and see if you’ve won so you don’t miss out on this amazing prize! 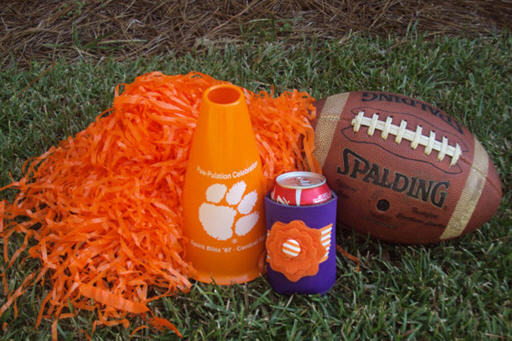 Big thanks to Andra and Bloomin’ Idiot Designs for sponsoring today’s giveaway… We love her adorable products – perfect for gameday for you and for your little Clemson fans. Morgan F and I Facebook'd this! Shared the link and also "liked" Bloomin' Idiot Designs. Rebecca S., from Orangeburg, SC!! I liked the Bloomin' Idiot Design FB page! Jill S. from New Jersey loves Bloomin' Idiot merchandise!!!!!!! Go Tigers...and Andra Hall! Heather L. from Inman, SC! Just shared the link on FB! I shared on my fb page! !